This doesn’t really fit neatly into either of the other clothing categories, this page is for clothing released at special events like Doll Carnival. 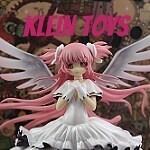 Details of Release: The shirts were sold at Doll Carnival 2008 for 500 yen each. Details of release: 200 White Dresses were given away at Doll Carnival 2013 to the first 200 attendees. 15 White Dresses were available free with purchase of a doll to customers who bought a doll during JPGroove.com‘s New Year event. It is not known whether the 15 White Dresses JPGroove offered were a part of the 200 given away at Doll Carnival or if 215 were made. 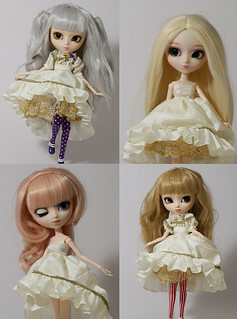 Dolls used to model: Varele (top right), Ally (top left), Io (bottom right) & Canele (bottom left).